Children living on opposite sides of the M5 don’t get to play together much. Children living in Capricorn/Vrygrond often don’t have the resources to cross the highway and visit their neighbours. Children in Muizenberg don’t tend to venture into informal settlements. There is a fear of the unknown as well as a real danger. This year has seen a number of violent flare ups in the area. People here are living on the edge of the bread line in very challenging conditions. However, Vrygrond has a special level of diversity with people from all over Africa living closely together. Discussions and exercises around how to relate the story to their own lives has built ownership of the story. Themes such as laziness, talents, freedom and responsibility are about taking control of your own life and making the folktale your own story. Each child is given an opportunity to perform a monologue as one of the characters from the folktale. Some wrote their own stories and others got text from Ntombi. These were performed for each other and the parents. 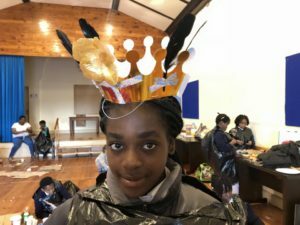 Naledi designed and cut animal masks and tails to suit each character. The children then stuck the bits together and got their fingers into the paint and glue buckets to decorate their own masks. The basic foundations of musical theatre were build. They created a dance for each character in the play and developed songs for these characters. These were then brought together by Ntombi and choreographed for the children to learn and perform as part of the Muizenberg Festival parade 2018. Now all these elements are coming together in a play involving all the children. Their performance will take place on the 28th of November at the Methodist church hall at 4.30pm. Parents are invited to bring their children and be inspired to enrol them for next year!